This will be a short(ish) post as I spend a whole day busy but not seeming to get very far. Saturday arrived and I arrived at Mustang Maniac to an eerie quietness. As Adam is cruising the Route 66 on holiday at the moment not much was happening at the offices obviously. I unloaded my car and took the refurbished bits and tools down to the work shop. The c4 transmission gearbox was still there leaking transmission fluid like it had been shot. 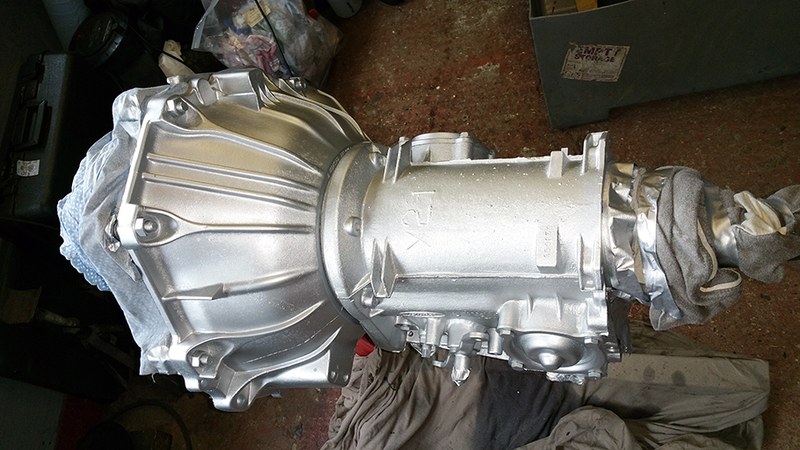 The task for the day was to clean it up, degrease it and spray it to match the back section of the gearbox. John was on hand to sort out the heating for me in the workshop to get the ambient temperature up in order to allow me to spray. I managed to clean up the outside, dry it all off and mask up the areas not requiring any spray. As this was aluminium I needed to use some Self Etch Primer to hold the paint to the casing. I gave the case a not to heavy a coating and allowed it to dry. Drying didn’t take long considering there was a fuel powered heater that looked like the back-end of the Batmobile when it fires up and the heat is pretty instant when it hits you. A slipped on the back-end of the gearbox to the primer in the pic below and there was not a lot of difference to be honest. The silver paint just made the case look like clean aluminium which was exactly the effect I was after. Two coats of the silver paint were applied in thin layers and looked pretty damn good once it was done and dried. With the gearbox now sprayed I turned my attention to a task I did a little while ago, the glove box. I mentioned that I had no clips on the back of the card insert which meant that I had the lip at the top inside the glove box. But as this was bugging me I found some small clips from a previous panel and slid them into place on the cardboard and held them down with tiny bit of duct tape. The clips were gripping the card fine, but I didn’t want them to turn on the first couple of turns of the screw. The duct tape was well out of sight and will never be seen. The self tapping screws were just enough to grip the clips and pull it tight to the back of the dash. Now it looks how it should do. While the dash door was off I took the time to give it a light freshen up with a satin black on the paint. Not too much, just a light dusting from a distance that still give the door that old look but clean. The inside of the door was given a another sating black dusting and the catch was removed to give it a spray of chrome. Unfortunately you can’t see it to well on the picture but the sating and chrome look works well. All in all I spent all day cleaning and spraying but there wasn’t a lot to show for it, but I am happy with the results. 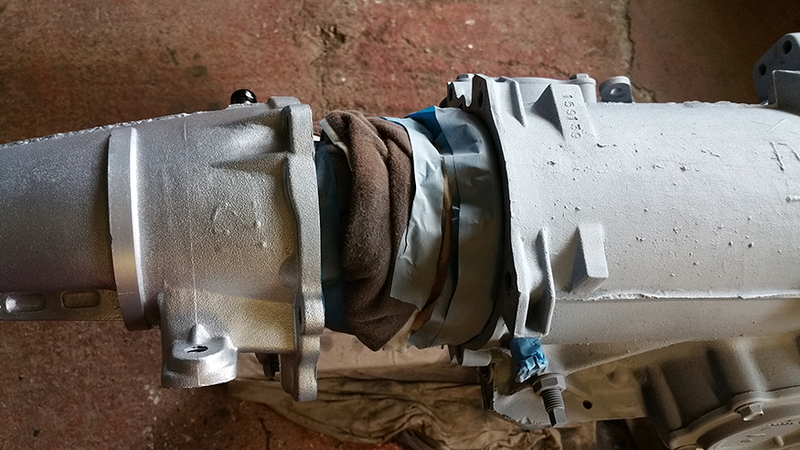 The next job is to replace the seals in the gearbox and get it fitted back into the car, hopefully that will be very soon. 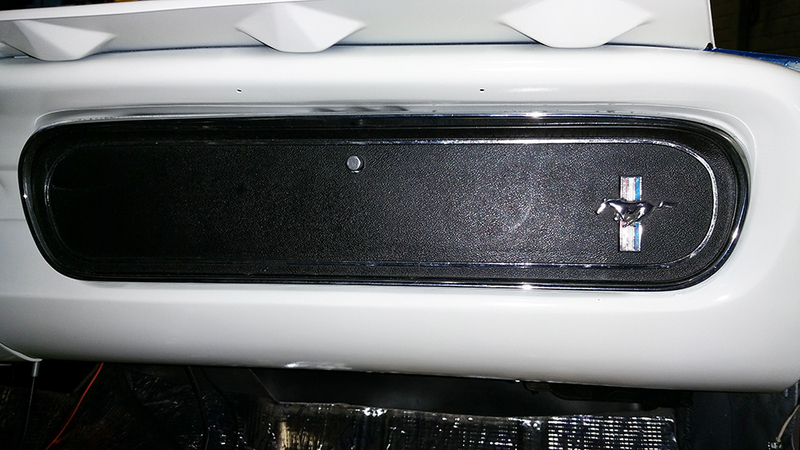 This entry was posted in General and tagged C4 transmission, glove box, Mustang, Mustang Maniac, One man and his Mustang, satin black, self etch primer, spraying. Bookmark the permalink. That is quite impressive for a replica Mustang. Modern technology with the classic look. The old grainy alloy case doesn’t clean up easily and looks dirty even when cleaned. Polishing the entire thing smooth would help, fine with a rocker cover but would take forever on the gearbox though. You can’t be far off now? Not to far away, but the headliner and glass has to go in yet, they will be milestones for the car. Then it’s the interior, wheels and exhaust. I used the Simoniz wheel silver spray and didn’t look silver more of a bright aluminium which pleased me. That I would say is some shining progress!